The poignant and dissonant post-punk on Cool Evil, the debut LP from St. Louis quartet Glued, is unrivaled in its ability to simultaneously captivate and isolate the listener into a nostalgia-fueled fog. The band channels a sound reminiscent of the likes of Melkbelly, Blessed, and Polvo that timidly perches itself between pop-laden hooks and outright chaos without ever being too predictable. The record opens with “Used To It,” an urgent and primal dissertation on the distaste of navigating through a world filled to the brim with punishing disillusionment. Pounding drums and a driving bassline complement weaving palm-muted guitars as drummer Chelsi Webster beckons, “Will somebody do something? / we never heed the call / to hear it stated plainly / shouldn’t be plain at all / but I should get used to it.” As the opener comes to an abrupt close, we’re greeted with the comparably cheerful “Beach Boys.” There’s a certain sense of unease and tension that lurks behind the pop melodies and bright vocals heard at the beginning of this track that leaves the listener feeling as if it is just a facade to be torn violently away from underneath them at a moment’s notice. As the song builds, the guitars intensify and this aforementioned tension rips the listener in two. On “Taming,” the third track from Cool Evil, we’re greeted by the voice of guitarist Sean Ballard, (with Webster taking harmony duties). The two complement each other very well and the track culminates with the repetition of a simple, yet contextually profound statement “I should go outside.” With the aptly-titled fourth track “Fish Song,” the group retreats a bit to give the listener some distance to catch up to speed after being thrown to the wolves on the previous song. Once they think you’re ready for what’s to come, the listener gets hit with the sickeningly-sweet vocals of Webster yet again. What follows is an interestingly delightful take on a not so pleasant adolescent experience, as Webster cheerfully sings, “Do you remember when I killed all of the fish?/ I was only trying to clean the tank / and I felt proud of the job that I did / hypnotized by the motion of their little fins / so I called up the stairs to you / to your old room / to tell you to come see them but your mouth dropped as wide / as those dead fishy eyes / do you think maybe they forgave me as they pushed out their last breath / knowing I had meant for the best?” Although a simple tale of childhood ignorance on the surface, the implications behind “Fish Song” are vast and engaging for many, to say the least. The second half of the record begins with the title track, “Cool Evil,” which features Ballard on main vocal duties and carries with it a dynamic that harkens back to the glory days of Sonic Youth, but with more complicated and frantic guitarwork than chaotic noise. The track starts out sane and palatable as Ballard sings, “Dazed and stuck in my ways / flood came rushing into the tunnel / braced as if I knew it was coming / I can still see my smug face smiling, drowning.” Shortly thereafter, Glued then begins their descent into a panic-inducing territory filled with overdriven bass runs, unsettling drum patterns, and obtusely cutting guitar leads that ultimately encapsulate the listener at the end. “King of Bees” follows next, a dynamic track that starts out somewhere in the realm of Metric but ends up building into a whirlwind of fuzz and witty, intricate guitar leads that perfectly accentuate the drums and bass. This track also features both Webster and Ballard on vocal duties, wandering seamlessly between Webster’s leads and Ballard’s harmonies. The band strips back their abrasive qualities for the slow, smooth intro to “Grounded By Pavement,” which I would like to believe is a nod to the 90’s slacker-rock group but I’m not entirely sure. Regardless, the way the band utilizes their spastic guitar leads to create a cohesive element is brilliant and shines through brightest here. Although still unsettling, there’s something innately warming and calming about this track even as it falls into a mess of tumultuous noise and unforeseen breakdowns towards the latter half. If “Beach Boys,” “Fish Song,” and “Grounded By Pavement” are considered the pop songs off the record, then “No Past” is the complete antithesis. The last, (and arguably most desolate), song on Cool Evil doesn’t exist to leave you feeling optimistic about life. Instead, “No Past” challenges the listener to examine their current state and think about the record as a whole and not just track-by-track. While there certainly are cheerful moments fluttered throughout the record, the overreaching theme is that of battling between one’s self and one’s environment for an understanding of who one is. This also relies on the recounting of past events to reflect on one’s position, (“Fish Song,” “Grounded By Pavement”), as well as understanding where one stands with themselves, (“Used To It,” “Cool Evil”). 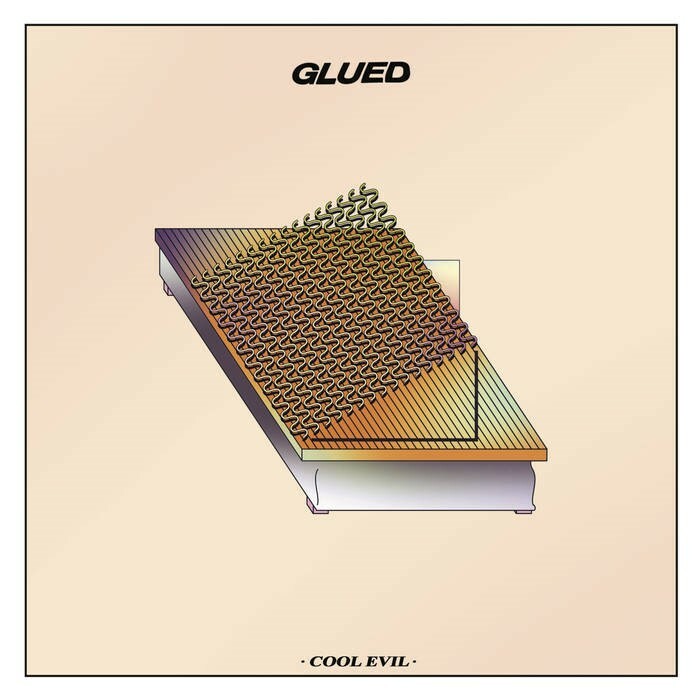 If you’re a fan of Melkbelly, Pile, Polvo, Nots, Deerhoof, or even just post-punk in general, you need to listen to Glued. Cool Evil is available via Born Yesterday Records.